I’m currently teaching Civics to 9th graders, and we have just about gotten to Article II of the Constitution AND Presidents’ Day is right around the corner. 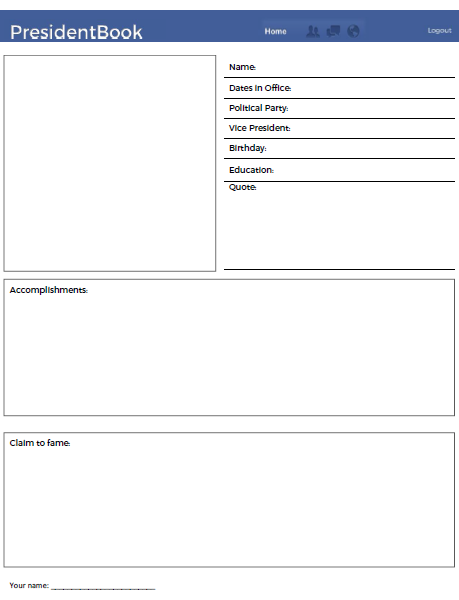 So I thought a fun activity would be to have my students create a fake Facebook-inspired profile for all of the presidents, which I will then tape to our walls. I wasn’t really happy with the free templates I found online, so I decided to create my own. And then I decided it would be nice to share. All I ask is that you let me know if you use it!